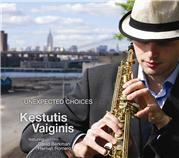 "Unexpected Choices" brings anticipated joy from the music of Kęstutis Vaiginis. His vision is wide-ranging from the subtle to the provocative, rooted in an appreciation and yet looking forward. Kęstutis is developing a hightly personal voice that is primed to make a significant contribution".